Part of our vision at Faith Community is to see Christ renewing neighborhoods and the valley. One way we live that out is through FaithWorks, a week we set aside each year with an intensive focus on short-term missions across the St. Croix Valley. There are opportunities to serve as laborers, on the food team, as nursery workers, on the prayer/evangelism team, and as administrative assistants. About 100 workers are needed each day of FaithWorks. We have more than 50 projects to complete next week! Online registration is now closed. You can register in person at the church building, starting on Monday morning, June 18. If you would like to make a financial donation to FaithWorks, you can make an online donation at this link. We also need coolers and various tools and wheelbarrows for use on the projects. So if you have any of these types of items that you couldl oan for use during FaithWorks, please bring them to the Kids Room by next Sunday, June 17. The Kids Room is located just behind the Community Room. Please mark all of your items. And, if you’d like to help with the items that go in lunches for workers, we would appreciate donations of bottled water, packaged snack items and home-baked goods. Just drop them off in the kitchen by next Sunday, June 17. 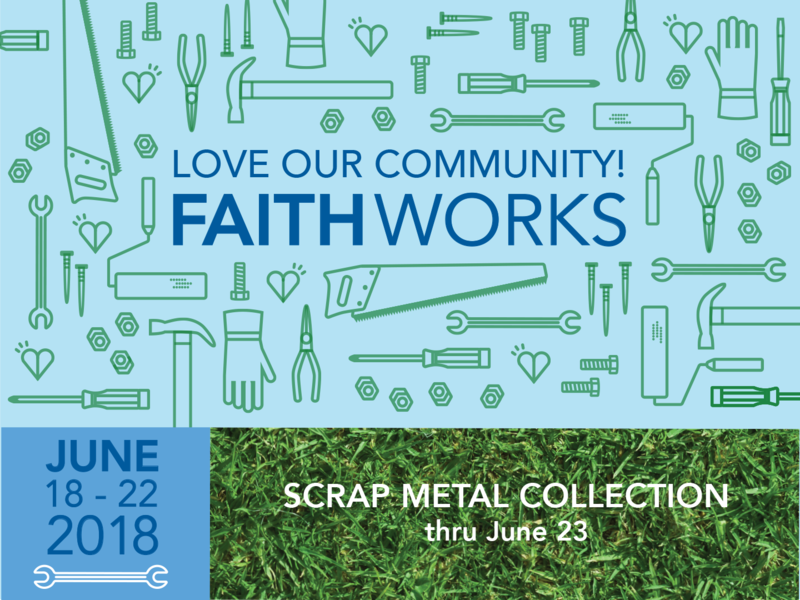 We’re also doing another metal collection in support of FaithWorks. Drop off is available from Saturday, June 16, through Saturday June 23, 2018, at dumpsters located at the house just south of the church building. We are not able to accept refrigerators, microwaves, A/C units, automobiles or anything with freon (unless the freon has already been purged). If you have questions about anything related to FaithWorks, please contact Randy Lau at 715-441-1515. And, if you have any questions about the needed food items or bottled water, please contact Karen Garden at 715-220-2507. WATCH this video from FaithWorks 2017 to learn more.